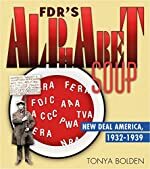 Review: Tonya Bolden’s FDR’s Alphabet Soup is a well-written nonfiction book where she paints a clear picture of what America’s economic situation was like six decades ago during the great depression. The author elaborates on many programs/agencies that President Franklin Delano Roosevelt, along with his administrative staff, developed to tackle the economic depression. The metaphor called "Alphabet Soup" was coined due to vast amount of acronyms utilized to name FDR's New Deal programs such as FERA - Federal Emergency Relief administration, PWA – Public Works Administration and the FDIC - Federal Deposit Insurance Corporation etc. Several months after Herbert Hoover became President in 1929, the Great depression was triggered by the mammoth stock market crash. Since the Republican strategy for prosperity in America is via trickledown economics and Herbert Hoover was a republican president, his economic recovery plan to help Big businesses instead of common man did not improve the economy. His economy revival plans lead to even more unemployment, poverty and homelessness. To show their disgust towards President Herbert Hoover’s economic policies, the homeless people called their shantytowns “Hoovervilles”. It is circa 1933 and Americans are desperately longing for a new direction for their economic wellbeing. Enter new President elect Franklin Delano Roosevelt and his “out of the box” thinking. FDR introduces bold plans for a sweeping economic recovery. His trickle up economic plans are met by stiff political, ideological, and legal challenges but he prevails and successfully improves American economy during his Presidency. This book is an excellent read not only for learning American history but the grave similarity of trying times six decades ago to the current economic crisis. The author’s use of 1930’s era pictures, primary source documents and slang words/phrases gives an authentic feel to the narrative. Those who read this remarkable book will not be disappointed. I would recommend this book for readers 10 and above due to the subject matter complexity. All in all, this book deserves 4 out of 5 stars! Review written by Ohm (6th grade student). We would like to thank Random House for providing a copy of FDR's Alphabet Soup: New Deal America 1932-1939 for this review. Have you read FDR's Alphabet Soup: New Deal America 1932-1939? How would you rate it?